This was published in Big Buds Magazine. The full legalization of cannabis in Mexico moved one step closer to reality on October 31, when the National Supreme Court of Justice, the highest court in the land, issued a ruling declaring the country’s existing ban on recreational cannabis unconstitutional. The Supreme Court noted that this right was not universal, and that some intoxicants could still be regulated or prohibited by the state. However, it proclaimed that “the effects caused by marijuana do not justify an absolute prohibition of its consumption,” setting the stage for a monumental change in Mexico’s existing drug policies. These two rulings apply only to personal possession, consumption and home cultivation of cannabis, all of which are currently illegal under existing statutes. The court’s decision does not address the growth, sale or distribution of cannabis products for commercial purposes, and as such will provide no legal protections, either now or in the future, for those currently involved in the illegal cannabis trade. This is not the first time Mexico’s Supreme Court has ruled on cases involving the recreational use of cannabis. In fact, the court issued three similar rulings between 2015 and 2017 that declared the state’s existing cannabis laws illegitimate. Most notable was a 2015 decision involving four plaintiffs from a group known as Mexicans United for Responsible and Tolerant Consumption, which was specifically set up to test the legality of Mexico’s blanket ban on pot consumption and cultivation. Their convictions for simple possession were overturned by the court, with the “free development of one’s personality” clause used as justification. 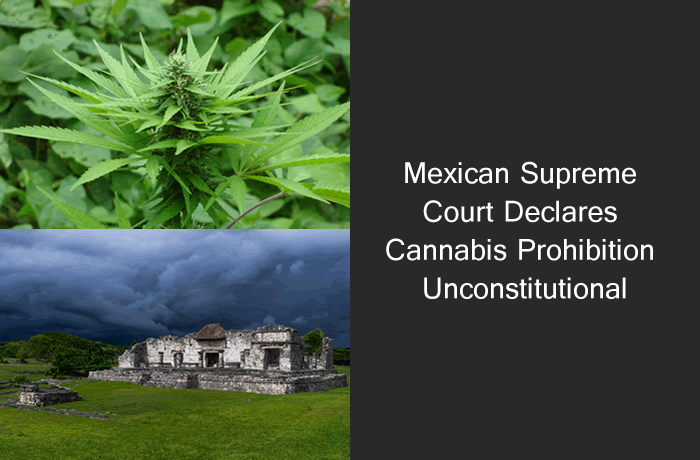 This was later followed up by two more rulings of a similar nature, which makes the latest cases the fourth and fifth times that laws against recreational cannabis were found to be in violation of the Constitution of Mexico. And it is this fact that is most significant, because under Mexican law, a Supreme Court decision only becomes binding after it has been reaffirmed by subsequent consecutive and uninterrupted decisions four more times, although the rulings do not become legal in Mexico until the legislature changes the law. At this juncture, lower courts who hear similar cases must respect the Supreme Court’s reasoning, and must apply it universally and find in favor of complainants who’ve been arrested under the auspices of laws that are now officially recognized as unconstitutional. As is standard practice, the court has now given Mexico’s Congress of the Union 90 days to repeal the existing laws, in recognition of the fact that police and prosecutors no longer have a legal right to apply them. The October 31 rulings have decriminalized cannabis possession across the land once and for all, as long as the person in possession of the cannabis has no intent to sell the product to someone else. Beyond repeal of existing laws, the next step for the Mexican Congress is to pass new laws governing the cultivation, sale, consumption and possession of cannabis for recreational purposes. In the past, this might have been difficult, or at least cumbersome and time-consuming, given that resistance to cannabis legalization among the established political parties in Mexico has been strong. But the federal elections of July 2018 have radically transformed the Mexican political landscape. In a landslide of historical proportions, the scandal-ridden Institutional Revolutionary Party was swept out of power by a new leftist reform party known as the National Regeneration Movement (Movimiento Regeneración Nacional, or the acronym MORENA in Spanish). New President-elect Andrés Manuel López Obrador has promised revolutionary change in many areas — including those involving drug policy and the unchecked violence related to Mexico’s drug cartels — and with MORENA winning clear majorities in both the Senate and Chamber of Deputies (the Mexican equivalent of the House) he should have the clout to turn his promises into reality once he assumes office on December 1. 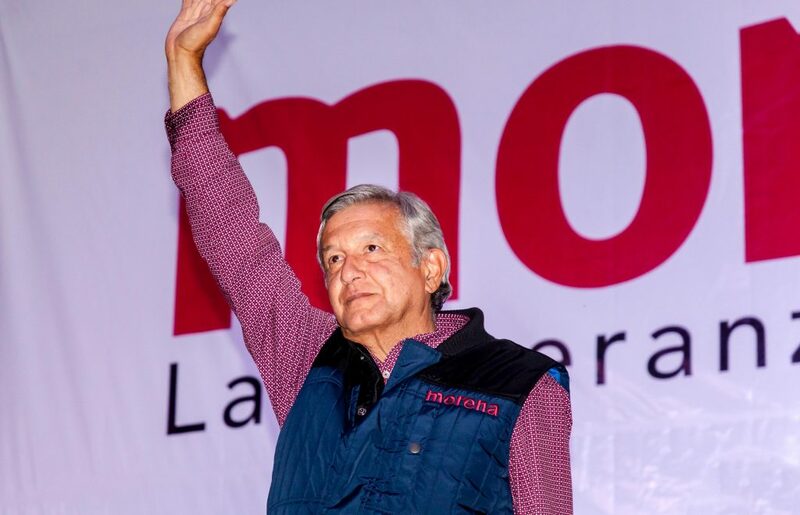 Obrador has been firm in his commitment to ending Mexico’s war on drugs, with the deployment of federal troops to take on the infamous Mexican drug cartels launched in 2006 by then-President Felipe Calderón. This ill-conceived campaign has resulted in more than 250,000 casualties over the past 12 years — most of which have been civilian deaths — as well as more than 37,000 people reported as missing since 2007. Mexico’s interior department says that in the first six months of 2018 alone, almost 16,000 murders were documented in Mexico, with the drug cartels, the military, and the local, state, and federal police all implicated in the killings. “The strategy up until now has been to use police and military force as the first tool,” politician Alfonso Durazo Montaño told Vox. “Our goal is to attack the deep roots of our security problems: political, economic, social, and cultural problems.” Durazo Montaño is slated to become the new leader of the Department of Public Security in the Obrador administration. So far, Obrador has been nonspecific in his pronouncements on cannabis, stating only his intention to make alterations in the way the drug is regulated. But his incoming Secretariat of the Interior, former Supreme Court Justice Olga Sánchez Cordero, has been outspoken in her opposition to the country’s current cannabis laws. President-elect Andrés Manuel López Obrador has so far not made a strong statement regarding his plans for cannabis policy. Most of the drug-related violence in Mexico is connected to the heroin and methamphetamine trades caused by internecine turf warfare between the drug cartels and the excessive use of force by police and military authorities. Mexico has also been an important trade route for cocaine coming through to America from neighboring countries in South America. Consequently, legalizing recreational cannabis may not do much to directly reduce the levels of violence that have plagued Mexico during the militarized drug war era. But the nation has been targeting the illegal cannabis trade for a long time, wasting personnel, resources, time and money in a campaign that amounts to little more than thinly veiled class warfare. If Mexico’s Congress of the Union, which is now in the hands of a MORENA majority, does choose to legalize recreational cannabis following the repeal of the existing laws, it will mean an end to at least part of the country’s ongoing drug war, which has brought so much heartache and misery to so many. Because of the latest Supreme Court ruling, legalization does now seem inevitable, but the pace of the changes and their specific nature are still uncertain and a long way from being decided.